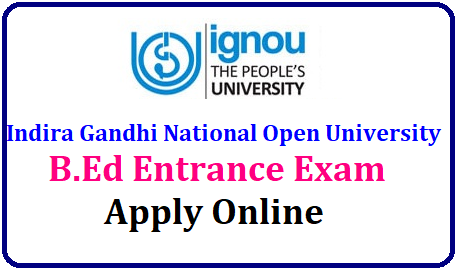 IGNOU B.Ed 2019 Entrance Exam - Indira Gandhi National Open University (IGNOU), New Delhi invites applications for admission to the Bachelor of Education (B.Ed.) for January 2019 Session. Indira Gandhi National Open University (IGNOU) provides B.Ed Admission for the 2019 Batch, given below the Full Details About IGNOU B.Ed. Admissions, Check Important Dates, Eligibility Criteria, Courses Fees and Many More in this Page. Indira Gandhi National Open University (IGNOU) B.Ed. Program has been designed with the aim to develop an understanding of teaching-learning process at secondary and senior-secondary level among student teachers. Objective of the Program - The objective of the program is on enabling student-teachers to reflect critically on perspectives of education and integrate holistically the theory and practices to facilitate active engagement of learners for knowledge creation. We will update the exact date of IGNOU B.Ed. entrance exam 2019 only after the release of its official notification. Candidates can obtain their admit card online via visiting the official website of university. Your admit card is an important document to appear in the test. Candidates without a valid admit card will not be allowed to write in the exam. Please download the Information Brochure January, 2019 in English or Hindi and read it carefully.